Is said to not let him leave until they've had a kickabout. 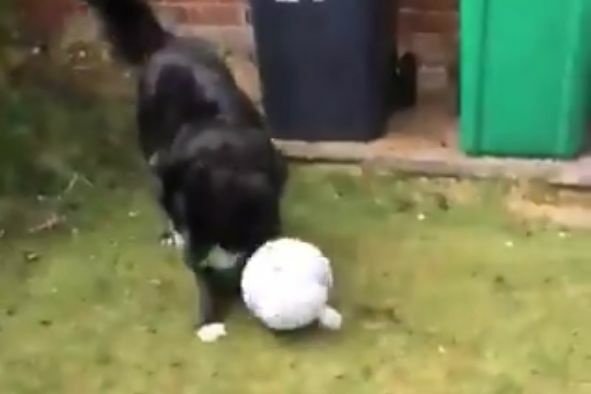 See the amazing passing dog who is said to not let this man deliver the post until they’ve had a friendly kickabout in the front garden of a house in Rosyth, Fife. The Scottish postman’s daughter uploaded a video of the pair kicking a football back and forth after requesting proof from her father. Hi Amy, we would definitely be interested in having your dog down for a trial with us. Seems to have a better touch and pass accuracy than our current Right Back @SamHood_ . Would fit perfectly into our team. The animal displays a tremendous amount of ball control, for a dog, and manages to keep the game going for a considerable length of time. As previously expressed by postie Davie Barbour to his family, it’s remarkable footballing skills have to be seen to be believed. The dog reportedly waits at the garden gate with a ball by its side before the mail is delivered. Apparently, if Barbour attempts to leave without playing then he will find his only exit blocked.